Home / Needlework What is decoupage and why is it needed? What is decoupage and why is it needed? 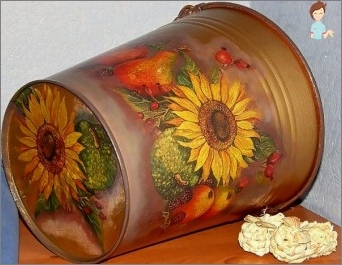 Decoupage on leather or leatherette is a special techniqueDecorating the surface of the product, changing its appearance. In the 12th century, the Chinese began using decoupage techniques to decorate windows, using paper, but they were not the founders of this art form. For several centuries the nomads of Eastern Siberia had already decorated the graves of their loved ones in this way. Masters of Venice made decoupage "Art for the poor". They decorated furniture, household items and shoes for those who could not afford to buy products inlaid with precious tree or precious metals. Fashion for the decorated products reached the nobility: in the rich palaces began to appear caskets and hats with decoupage details. In the 18th century, imitation of natural inserts on furniture and fabrics became so fashionable that decoupage became an art form. Some subjects were perfected over the years. For those who can not draw, decoupage is a salvation. Changing the appearance of a thing, giving it a new image with the help of simple techniques, is very helpful in everyday life. Select items that you want to transform, and there are drawings for that. They can be on special napkins or ordinary postcards. Later they are transferred to the renewable surface. The list of additional components depends on what result you want to receive. A special lacquer for decoupage is applied from above. The last stage is very important. The varnish is not only "Merge"In a single whole surface and pattern, will make the thing complete, but in the future it will protect the incrustation from external influences: scratches and damages. How to update bags, covers, in which you insert a passport and other documents, beauticians - it is worth considering in more detail. Decoupage bags made of genuine leather in stages. The bag is pre-washed or washed, the surface is thoroughly dried. For reliability, it can also be degreased with alcohol. The main background is being prepared. For this, the surface is densely covered with acrylic paint of the desired color. Selected images are applied to selected places, they are covered with glue. After the glue dries, these pictures are closed with a layer of transfer medium - the rubber transparent film will reliably protect the pictures from fading. If you like the drawings are thick, then they are in advanceShould be covered by a transfer medium from 2 sides. After drying, which takes about a day, even a dense postcard to the touch becomes similar to rubber. Before installing a pre-prepared postcard, its minutes for 20 are placed in the water with the back side. After that, the medium from the wrong side departs, and it turns out as if the picture on the film. Paste the picture in the usual way: applying a layer of glue on top. Bring the picture to perfection, painting the intervals with paints, tracing the contour of the tulip - if necessary - the frames. After the materials have dried, you can immediately use the bag. The technique of making decoupage on natural leather and leatherette is practically the same. Covers are not updated - it's easier to buy a new one. But why not enjoy yourself by improving the new cover of your passport or diary? Master-class on work with the cover of the diary: how to update it and ... to grow old. All sheets of the diary, if the cover is not removed, you can protect it with a plastic bag - the sheets are carefully inserted. The cover is degreased, treated with an abrasive. The picture is glued, and when it dries, waves around it are made of glue in several layers. Then, in the right places, you need to go through the gold paint, make the cover a craquelure, in places it is uneven to apply black paint. To save the picture from damage and to complete the finish, the surface is covered with varnish for decoupage. To give the cover a more stylish look, after the product dries, you can perform additional actions. Remove the plastic bag, and at the edge of the sheets, apply the gold paint with a sponge. For stylishness, you can make edging with black and brown paint along the edges of the cover. If you seriously deal with decoupage, you will have to look at more than one master class. Decoupage is done not only on the skin - it is possible to modify the surface of the fabric, wood, even glass. We will have to improve "Park of tools". Beginners to master this art are limited to scissors, but if you have to use more dense materials as an ornament, you will need to purchase a special knife, the blade of which rotates. It will be more convenient to apply soil and paint not using a brush, but with a special roller. Glue materials not only with glue. In the course can go to acrylic lacquer, glue pencil, nail polish, wallpaper paste and even egg white. Everything depends on the technique used and the further use of the product. In some cases, to make the drawing easier to lay onSmooth surface of leatherette, it is more appropriate to use an iron or a hair dryer. The picture then fuses and looks more organic. Of course, the surrounding space will need to be carefully insulated. The iron is placed directly on the paper from above - it is not recommended to drive them, otherwise creases may form; The hair dryer must be kept at a distance of 5-8 cm. Pictures can be cut from special decoupage napkins or apply any printouts, use postcards, drawings from fabric surfaces. 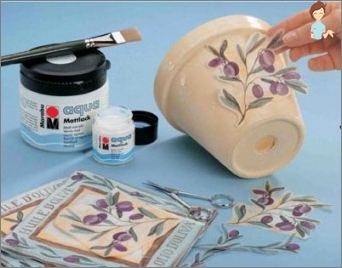 Doing decoupage on the imitation of the skin, it is better to use glue for textiles. It is not only safer, but also cheaper. The skin is glued only by special means. 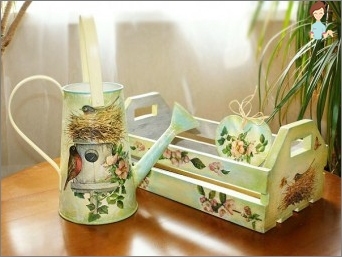 You can not only make yourself happy with decoupage. Modified items become excellent gifts to family and friends for the holidays. In this case, it is desirable to decorate new products.